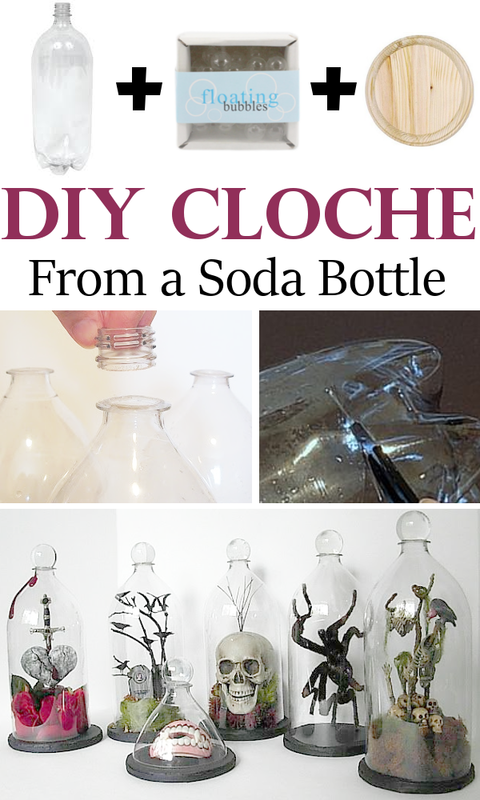 Cut off the bottom of the bottle and the threads from the top. Arrange items on your wooden plaque and place the bottle over the top. I love the look of the floating bubbles but I could only find them for sale in large batches. Unless you plan on making a lot of cloches, they may not be worth the price. Another option would be painted wooden beads or a small Styrofoam ball. To make the edges of the bottle smooth after you cut it, place a pan on the oven on low heat. Rub the bottle around on the pan for a few seconds to slightly melt and smooth out the plastic. If you have any trees in your yard that need trimmed, save a few wood slices and use in place of the wooden plaque.